A pre-finished floor that already comes finished from the manufacturer. It comes in the color and species of your choice, thus no sanding or coating is required. Each piece has a beveled edge for a blended fit. Also, single pieces may be easily replaced if damaged. Known for its hardness and durability (it’s most scratch resistant), laminate flooring is not real wood, but merely a photograph that is duplicated on every plank. It comes ready to install from the manufacturer in the color and style of your choice, thus no sanding or coating is required. The core of the product is typically made of High Density Fiber (HDF) and is generally the quickest to install and the most affordable option. It simply clicks together over a pad underlayment. A floor that is neither glued down or nailed down. Ideal over concrete or below grade installations. In this method, the individual boards attach to each other either by means of gluing (tongue and groove only) or clicking together but do not attach to the sub-floor or concrete, rather they are laid over a pad which allows the floor to move and expand to changes in humidity. Ideal for floors that cannot be nailed. Most commonly glued down to concrete that is on or above grade applications. It can also be glued to plywood if preferred. Engineered hardwood has a real wood veneer layer on top (about 1/8”) and is constructed in multiple layers of cross-grain wood that are bonded together. The “engineered” product has been designed to provide greater stability, particularly where moisture poses a problem, thus greatly minimizing any expanding and contracting of the wood. Raw, natural wood of your choice that is installed, sanded, and finished on site for a completely smooth and flat surface with no bevels as apposed to pre-finished wood with bevels. Unfinished wood typically takes twice as much time as a pre-finished floor, but has the benefits of choosing your own custom stain, finish, and sheen level (gloss, semi-gloss, satin, matte). Janka, short for the Janka Scale or Janka Hardness Rating, is a way of communicating how hard a wood is. 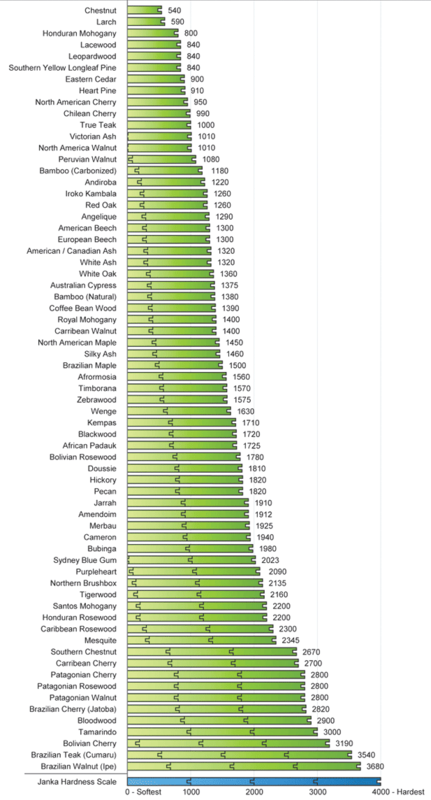 The Janka Hardness Chart lists woods by their rating. Of the characteristics and properties to consider when choosing your hardwood flooring, the most important is probably the relative hardness of the wood. 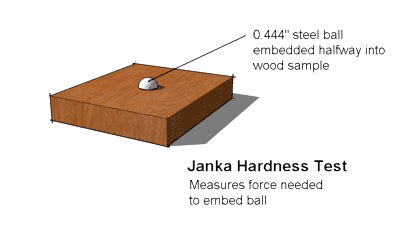 A wood's relative hardness is determined with the Janka Rating System, which measures the force required to drive a .444 inch steel ball into the wood until half the diameter of the ball is imbedded in the wood. The Janka Hardness Scale lists the Janka rating of wood and has become the industry standard for determining whether a given wood is suitable for flooring material. Moreover, the Red Oak, which has a Janka rating of 1260, is the industry benchmark for comparing the relative hardness of different wood species. Since the hardness of the wood varies with the direction of the grain, both side testing and end testing is performed on wood. While it's true that the hardwood used in flooring is durable enough to withstand normal use, that doesn’t mean that the wood won’t dent or mar with a hard enough impact. Even appliances and furniture will eventually leave dents on a hardwood floor. There is no relationship with wood hardness and finish wear; therefore manufactures do not warranty wood flooring against scratching and denting. Fortunately, the natural beauty of wood floors can easily be restored by sanding and refinishing the flooring. Wood is a natural material and every piece is different. The growth patterns of each wood species are influence by its environment: the sunlight, minerals in the soil, overall climate, and even insects. Some of the most beautiful wood is that which has actually been damaged by nature itself. Although the higher the Janka rating, the harder the wood, don't mistake hardness for the best wood. In addition to a wood's hardness, other qualities to consider when choosing a wood floor include both aesthetic and physical properties. For example, choose a wood with a texture, grain, and color that fit your style, and take into account the wood's durability and stability. And of course, the wood floor you choose must be available and fit within your budget. Use Janka as part of your decision making process, but not the only factor. Hardwood flooring is priced by square foot, so it's important to have your measurements when pricing your flooring options. Surprisingly, the cost of hardwood flooring isn't necessarily based on Janka rating, where the higher the Janka rating, the higher the price. Rather, exotic, specialty, and scarce woods are more expensive than more readily available woods. For example, for years, fir was less expensive than oak but since the fir resources have greatly diminished, now the opposite is true. Today, oak is the most popular hardwood flooring choice. As you research hardwood flooring options, keep in mind that there are two main groups of flooring materials: solid wood and engineered wood. Solid wood is milled from a solid piece of wood and is generally used over a wood sub-floor and nailed to the sub-floor. Engineered wood is made by bonding layers of veneer and lumber in at least three layers in a cross-ply arrangement and is used when installing the wood flooring to concrete. For consumers, it's important to recognize that each wood has its own personality and to decide which hardwood flooring is best for your specific application. Understanding the Janka table, and pros and cons of each wood will help give you more realistic expectations about how your wood flooring will perform. 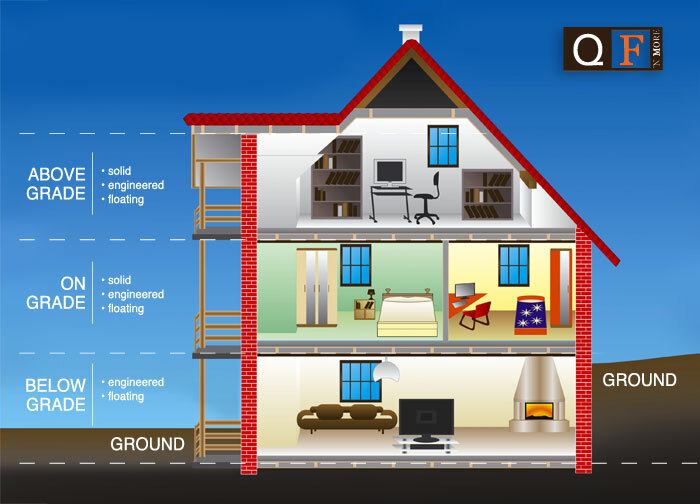 Choosing the right floor for your home will give your room a natural beauty that will give your room warmth and personality. Did you know hardwood can be used in a kitchen? 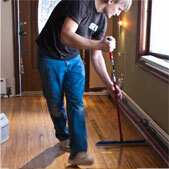 Take some time to read about how to take care of a new floor.